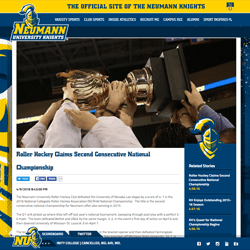 The Neumann University Roller Hockey Club won their second consecutive National Championship by defeating the University of Nevada Las Vegas (UNLV), 4-1, on Saturday, April 9. The club, who also won the 2015 National Collegiate Roller Hockey Association (NCRHA) Championship, finished the 2015-16 season with a record of 24-1 before winning the ECRHA Regional Championship in Feasterville, PA and then sweeping through the national tournament. The 2016 National Championship was played in Cedar Rapids, Iowa from April 6-10. 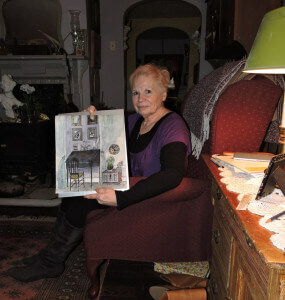 Helen Litwa has worn many hats in her lifetime, which include mother, grandmother, great-grandmother, artist, historian, volunteer, restaurant owner, and good friend. As chairperson of the Aston Township Parks & Recreation I would like to thank everyone who gave their time to volunteer for our very successful Easter Egg Hunt/Bunny Meet & Greet! Aston resident Casey Berardi was recently presented a proclamation by Aston Commissioner’s President Jim Stigale for achieving the rank of Eagle Scout. Casey, the son of Charles and Leslie Berardi, is a 2014 graduate of Sun Valley High School and is currently attending Warren Wilson College in North Carolina where he is studying political science and global studies with a minor in Spanish. 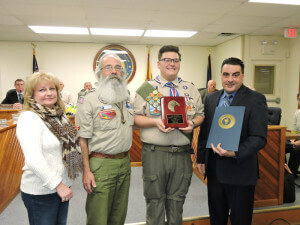 For his Eagle Scout project, Casey, a member of Scout Troop #225, planned and organized a community health fair. He communicated with various health organizations and during the fair, which took place in April 2014, information was distributed to attendees by Main Line Health facilities and a blood drive also took place. As a result, 41 units of blood was collected during the drive, which surpassed Casey’s goal. Casey began scouting while in the second grade when he joined Pack #292 as a Wolf Cub. He advanced to Webelo Scout , where he earned the prestigious Arrow of Light Award. Casey crossed over to Boy Scouts with Troop#225 in 2007. 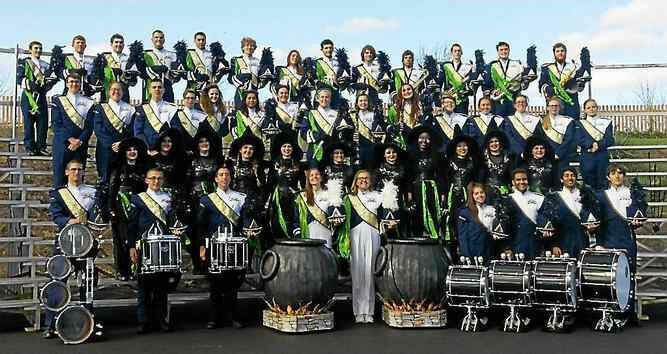 While at Sun Valley, Casey was a member of the Tri-M Music Honor Society, as well as the marching and concert bands. He also participated in the drama club, chamber choir, concert choir, and was a committee member for the class of 2014. At Warren Wilson College, Casey is co-convener of the student caucus, which is the governing body of his school. He also participated in the World Climate March, and the HkonJ March for environmental justice and social equality in the United States. Scouting has played a vital role in Casey’s life and along with the direction of his parents, helped him to learn the importance of giving back to the community. Casey has volunteered for Scouting for Food, Adopt a Highway, and Cub Scout Day Camp. 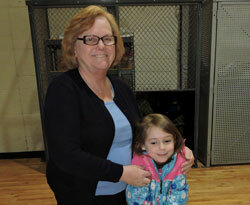 In he future, Casey hopes to become a Pennsylvania State Representative. 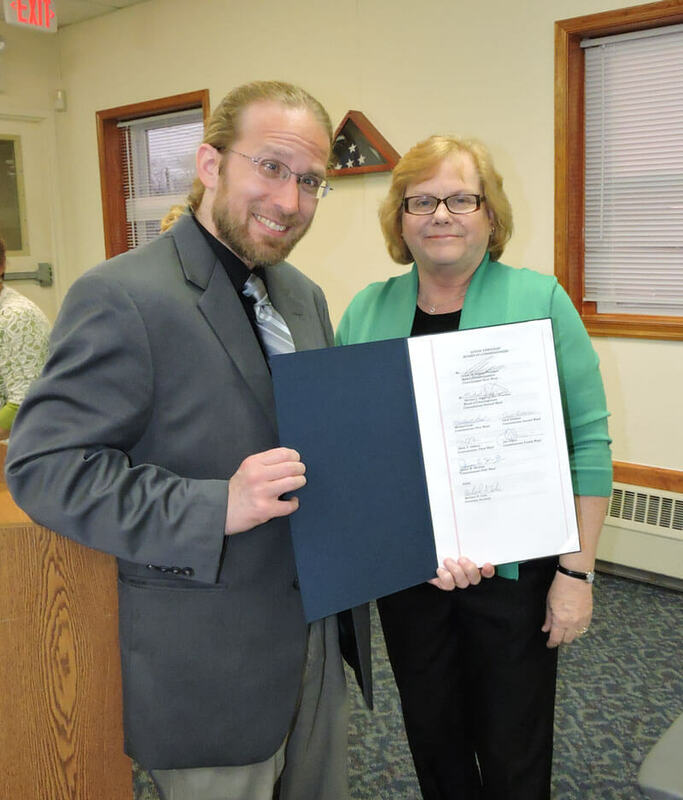 Aston Commissioners, March 16, recognized the week of April 10-16 as National Library Week. 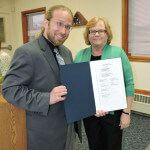 2nd Ward Commissioner Carol Graham, who serves as liaison to the Aston Public Library, presented library director Stephen Sarazin with a proclamation on behalf of the board. Graham praised the work done at the library, making special mention of Sarazin’s dedication as well as all the hard work of the library staff and volunteers. Aston Commissioners, Feb. 17, recognized Sun Valley High School Junior Kate Lannon for her excellence on the basketball court. The daughter of Mike and Terri Lannon, Kate scored her 1,000th point on Jan. 9 when the Sun Valley Vanguards defeated Chester High School 52-41. 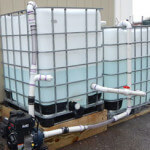 New Township brine dispensing equipment. The Public Works Department used a little ingenuity to make their own brine truck for the winter season. 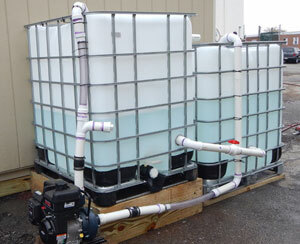 A brine maker is similar to what PennDOT has and uses a mix of salt and water to prep the roads before a winter storm. The Public Works employees went online and found the instructions before constructing it with about $400 in materials. The truck uses a 300 gallon tank and covered more than expected in its first trip around the Township. It took about three days to make and it was first used to prep the Township for winter storm Jonas. Crews treated the roads 24-48 hours before the storm. The brine helps snow not stick for awhile and helps it come up easier when it’s plowed. “The brine truck seems to be working really well,” said Russ Palmore. “There might be some upgrades to the truck in the future. We are lucky to have a lot of skilled people,” he said. Aston Commissioners, during a recent meeting, announced the hiring of new part-time police officers Thomas Piraino and Jonathan Curtis, effective Jan. 4. Piraino is a graduate of Salesianum School and is currently studying emergency management at Delaware County Community College. He is a sergeant in the Delaware Army National Guard and a veteran of the war in Afghanistan. Piraino is a member of the Aston Township Fire Department. 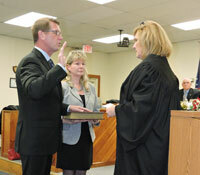 Curtis previously worked at the Delaware County Park Police and the Aldan Borough Police Department. 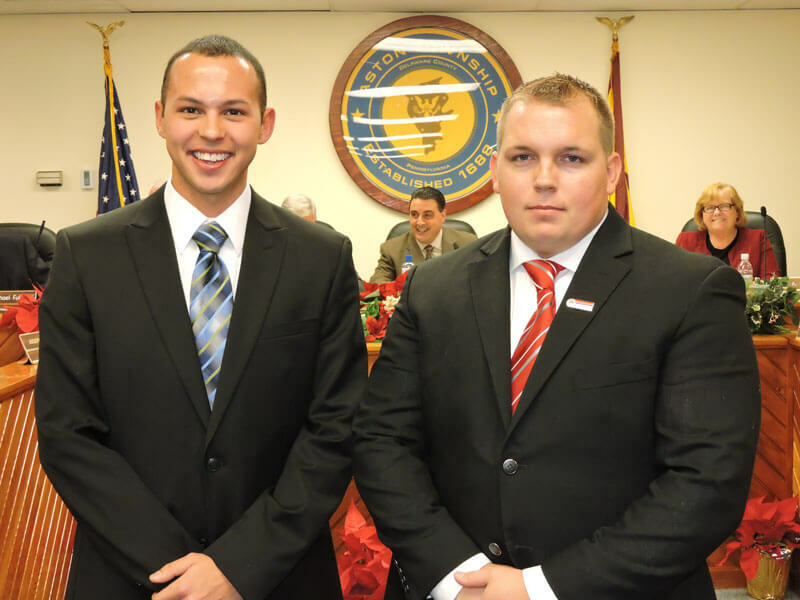 He is a graduate of the Delaware County Community College Municipal Police Academy and is employed as a part-time officer in the Chester Township police department. 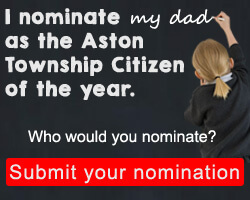 Curtis is also a member of the Aston Township Fire Department. Both candidates passed a thorough medical exam, along with a psychological examination. 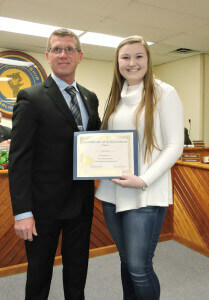 Aston Commissioners, during the January 20 meeting, presented a proclamation to the Sun Valley High School Band.